USA 76 is the best teambuilding vessel on the Bay. Today it is the most modern America’s Cup yacht in the world available for team offsite activities. If you have a competitive group and want to challenge them, enter our USA 76 Bay Challenge. This timed event requires participation from everyone aboard as we race against the clock on the 34th America’s Cup race course. Your group will receive a dockside safety brief, brief historical presentation on the America’s Cup, and an overview of the objectives. Then it is time to suit up with our provided racing gear and board USA 76 for a thrilling day on the water. #1 Define Rolls –Racing positions will be presented dockside and assigned to members of your team. #2 Hoist the Sails -Our eleven story mast can support more than 2,500 square feet of sail area. Groups of four will take turns working the coffee grinders to turn the gears that raise the sails eleven stories up. #3 Practice Maneuvers -We will go through a series of practice maneuvers with the team learning how to efficiently tack the yacht. Communication and timing are critical for success. #4 Race is On –With your elected skipper at the helm, USA 76 will cross the start line at full speed en route to the Golden Gate Bridge. #5 Tactics –Based on information presented in the dockside briefing your team will need to make tactical decisions to choose the fastest path to the Golden Gate Bridge and back. 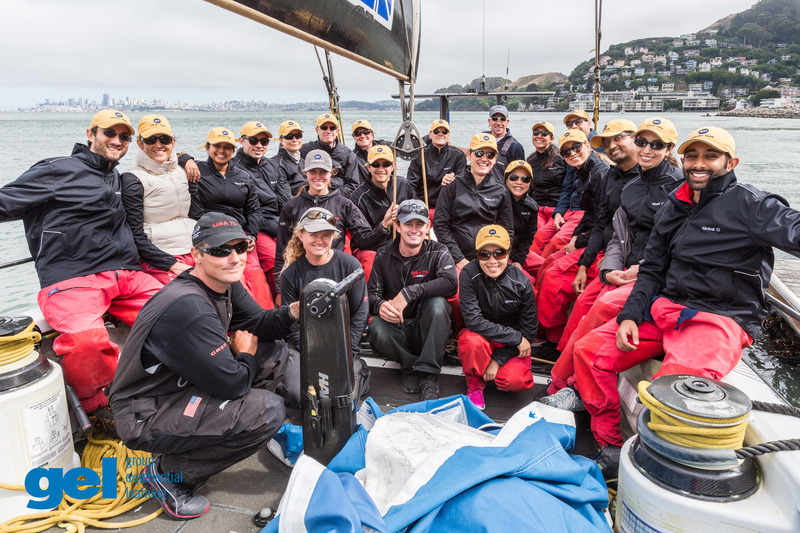 San Francisco Bay is often cited as the most challenging place in the world to sail and your team will need to consider wind and currents to cover the distance quickly. #6 Finish -Celebrate as you cross the finish line and the timer stops. This is a great time for a champagne toast and our crew will provide feedback on how your team did.